I'm a big fan of Diners Drive-Ins and Dives although once in a while I don't find the places as top-notch as Guy Fieri thinks they are. 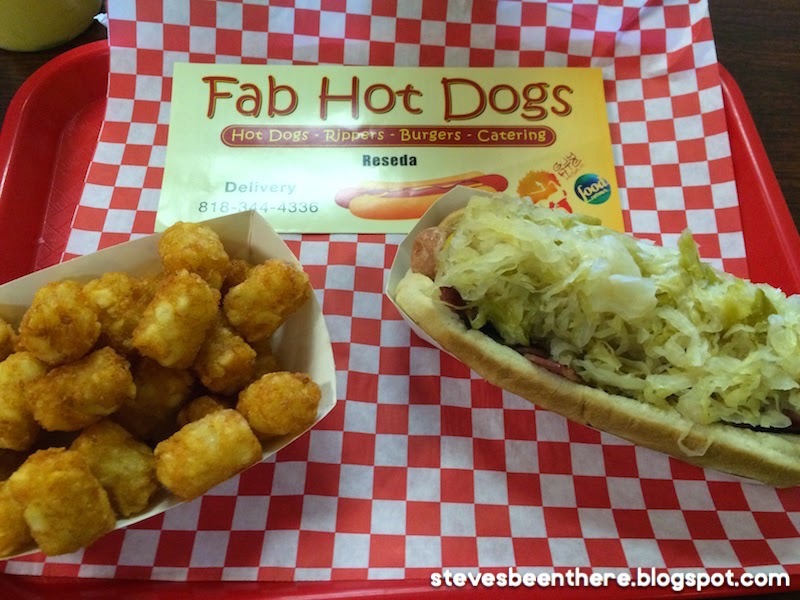 So I am glad to report that I had an excellent lunch yesterday at Fab Hot Dogs in Reseda, California (in the San Fernando Valley just north of Los Angeles city and near Hollywood). 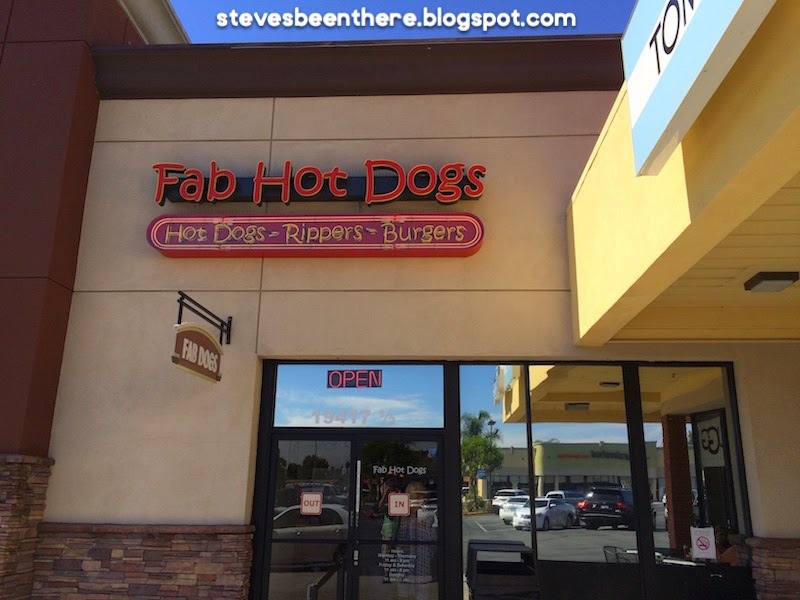 Fab Hot Dogs is in the corner of a shopping center on Victory Blvd., so there's plenty of parking. The place is clean and decorated pictures of the youth sports teams they sponsor. It wasn't crowded when I got there although I understand that even when it's crowded, the line moves pretty fast. There are some tables outside, too, although they look out over the parking lot. You can get the dogs in a variety of flavors, and in 7" or foot long. You can also ask for any of the hot dogs as "Rippers" which means they are fried, although only the 7" dogs can be Rippers. I got the Reuben as a Ripper, which uses a beef and pork sausage which was really tasty. They piled on the sauerkraut and Swiss cheese, and there was bacon there, too. I'm not sure why there was bacon on there; maybe if you order a Ripper you get bacon, too? So I really liked this place and would go back if I'm nearby. What's the best fried hot dog you've ever had? Let me know in the comments below. Check out another review with pictures at Eating My Way Through OC blog. I've been there and agree the dogs are fab!